Ahlen, January 2016. – From a young family with children to an elderly couple – each stage of life and every person has their own individual needs. Builders and modernisers therefore are well advised to mind a careful design. Effective architecture must address the requirements of more than one age group. Ideally, the home interior should be designed to suit people of all ages, enabling them to live a long and autonomous life without assistance. The bathroom is the one place in the home that reflects our changing habits in different stages of our lives. While young children are gradually introduced to personal hygiene, parents are compelled to use the bathroom mostly “in passing”, lacking the time to enjoy quiet moments. Older people, in contrast, spend considerably more time in the bathroom, enjoying the use of convenient aids and practical accessories. The one thing they all have in common, regardless of age, is the absolute centrality of independence and autonomy in the bathroom. Kaldewei is the ideal partner for the sophisticated and effective design of a multigenerational bathroom, offering floor-level shower surfaces, bathtubs and washbasins made of superior steel enamel that blend safety and comfort perfectly with aesthetic appeal whilst ensuring maximum mobility for any member of the family. No tripping, no slipping, no scalding – Kaldewei products deliver exceptional benefits in terms of safety. Fitted fully floor-flush, the enamelled shower surfaces of the premium manufacturer provide absolute ease of access – with no edges to trip over. 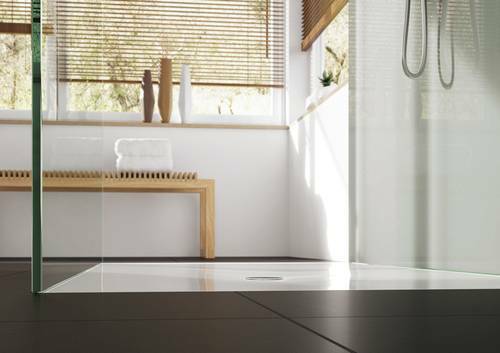 The Kaldewei Secure Plus full-surface anti-slip finish, which is permanently fired onto the shower panel, is virtually invisible guaranteeing complete and lasting safety and comfort underfoot. Those who prefer a bathtub to complement their floor-level shower surface can opt for a model with a spacious rim or with practical grips that make it easier to get in and out of the tub. For further comfort, the electronic controls Kaldewei Comfort Select for the bathtub allow adjustment of the water temperature at the tip of a finger to precisely the desired degree and storing it for future convenience. As a useful extra, it helps to protect children from bath-time burns and scalds. 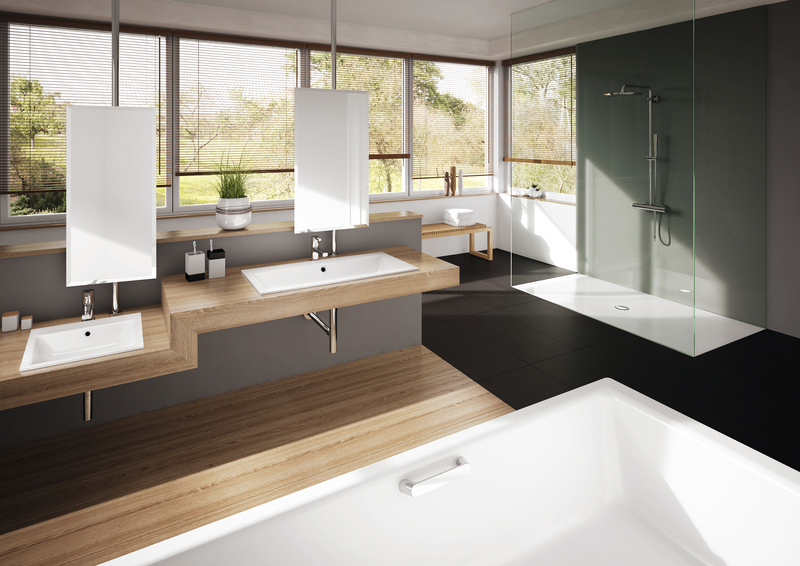 Kaldewei bathtubs and shower surfaces now come with the perfect companion, in the form of matching washbasins made of superior Kaldewei steel enamel. Available in different sizes, they can easily be fitted at a lower height to accommodate children. Made of unique steel enamel, all Kaldewei products guarantee extraordinary longevity. With flawless appeal even after decades of use, they are designed for a lifetime of enjoyment. As a further material advantage, the seamless and pore-free surfaces made of Kaldewei steel enamel are exceptionally hygienic. Thanks to the Kaldewei easy-clean finish, the water simply rolls off taking virtually all dirt and limescale particles with it. The result is an effortlessly clean and hygienic bathroom. Shown here: bathtub Puro Star, washbasins Puro and enamelled shower surface Scona. Kaldewei is the ideal partner for the sophisticated and effective design of a multigenerational bathroom, offering floor-level shower surfaces, bathtubs and washbasins made of superior steel enamel that blend safety and comfort perfectly with aesthetic appeal whilst ensuring maximum mobility for any member of the family. Shown here: floor-level enamelled shower surface Scona. Fitted fully floor-flush, the enamelled shower surfaces of the premium manufacturer provide absolute ease of access – with no edges to trip over. Shown here: built-in washbasin Puro. 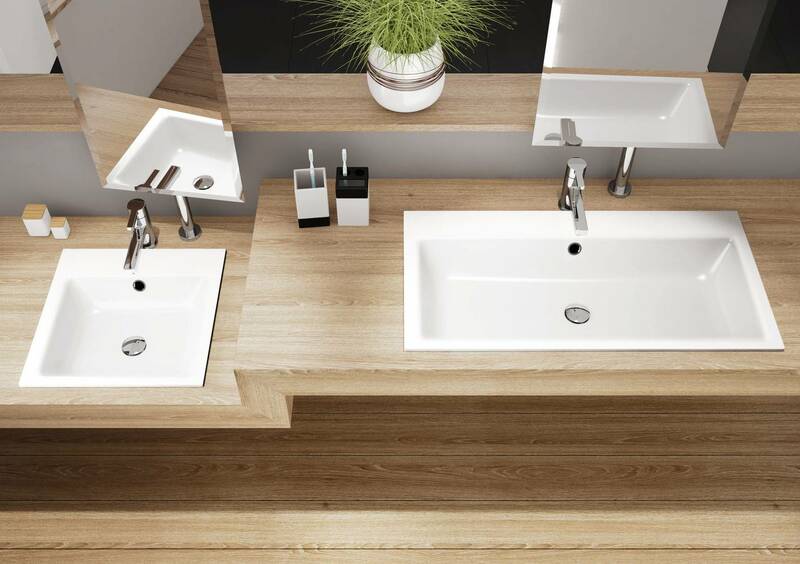 Kaldewei bathtubs and shower surfaces now come with the perfect companion, in the form of matching washbasins made of superior Kaldewei steel enamel. Available in different sizes, they can easily be fitted at a lower height to accommodate children.